2. 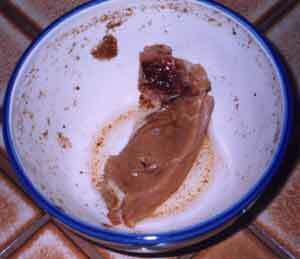 You can put a T-bone steak in a bowl of coke and it will be gone in 2 days. let the "real thing" sit for one hour, then flush clean. The citric acid in the coke removes stains from vitreous China. 1. The active ingredient in Coke is phosphoric acid. Its pH is 2.8. It will dissolve a nail in about 4 days. Phosphoric acid also bleaches calcium from bones and is a major contributor to the rising increase in osteoporosis. 2. To carry concentrated Coke syrup, the commercial truck must use the hazardous material place cards reserved for highly corrosive materials. 3. The distributors of coke have been using it to clean the engines of their trucks for about 20 years. 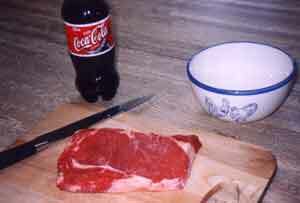 We decided to research claim #2: you can put a T-bone steak in a bowl of Coke and it will be gone in two days. Step 1: we began with a nice juicy steak, a boneless T-bone. and dumped in enough Coke to fill the bowl. Step 2: we checked on the steak piece after 12 hours. 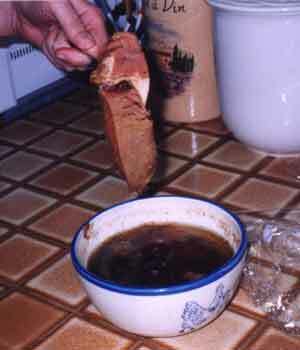 as it did when we first plunked it into the bowl. nice and pink and ready for the barbecue. Step 4: getting tired of the great steak experiment. We've left the steak on the counter for an additional 24 hours now. It doesn't smell yet, but it still looks just a good as it did two days ago. No sign of deterioration, and it definitely has not disappeared. We are concluding that this COKE FACT is wrong! The next experiment was Coke Fact #3: Pour a can of Coca-Cola into the john and let the "real thing" sit for one hour, then flush clean. The citric acid in the coke removes stains from vitreous China. We found a toilet with a nice lime stain at the water level. 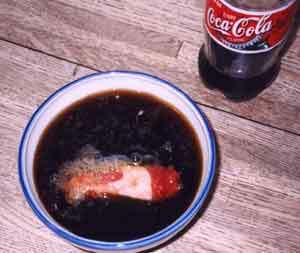 Coke was poured into the bowl. We let it set for over an hour before flushing. The lime stain was still there, but now it wasn't the usual whitish color, it had become definitely Coke-colored, which is not an improvement at all. We considered trying Coke Fact #4: To remove rust spots from chrome car bumpers: Rub the bumper with a crumpled-up piece of Reynolds Wrap aluminum foil dipped in Coca-Cola, but we couldn't find a car with a chrome bumper. Conclusions: Coke Facts are a bunch of hooey! Yet another item for the Bunk File.